you can't get more innocent then the beach boys. okay well, you could, but still. 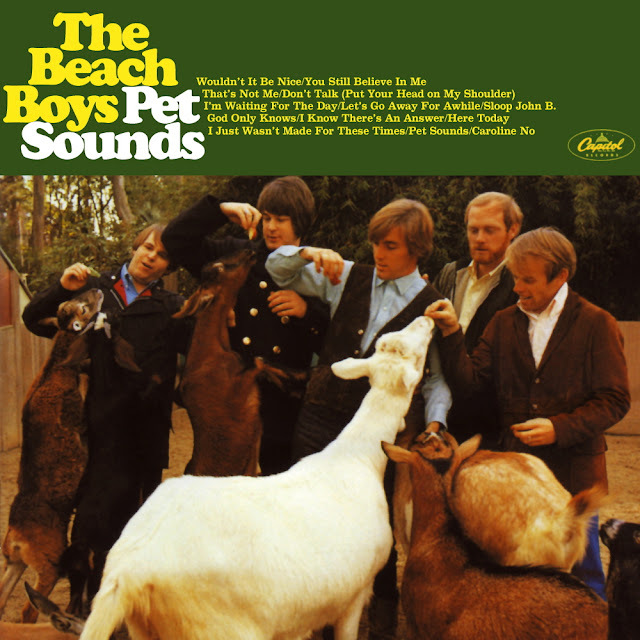 there is something incredibly uplifting, sweet, and void of complicated feelings about the beach boys in whole, specifically with this album that i sort of love. i find i have more personal connections with a song from pet sounds, rather then the album in its entirety. handsome and i walked down the aisle to the instrumental of god only knows and danced our first dance to the song as well. it was also the song he sang to me post birthday festivities when we first started dating. i know, enough already, but i can't help but gush about the memories that song specifically holds for me. also, we may or may not have used another song from this album in our wedding video. cough, sneeze, wouldn't it be nice was the song. for some reason, i usually see this album as a montage to the 1960's advertising world. simple words with sunny lovey moments packed behind them makes me think of playful beach ads, young scout ads, smiling cigarette and ironing ads. in short, this album makes me think this is the way the 60s sweethearts would like to be remembered, and the hopeless romantic in me sort of loves that no matter how unrealistic it may be. here, here, here, here, here, and here!